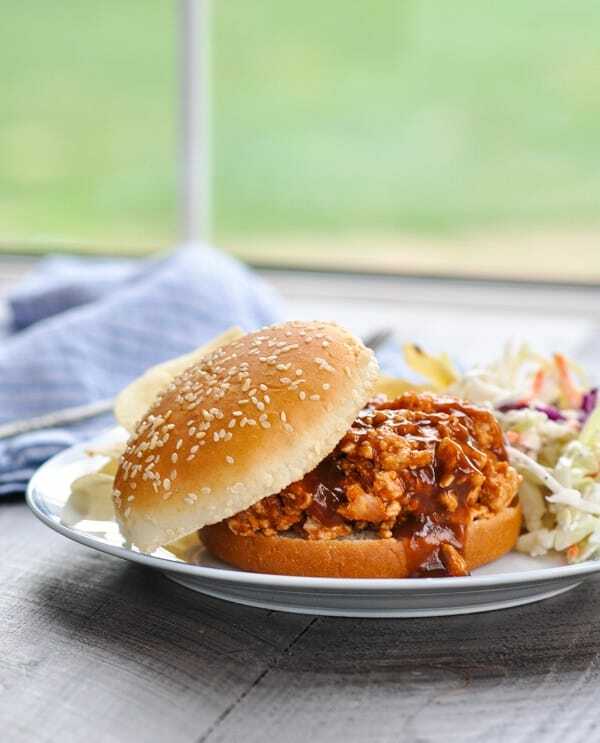 This simple and delicious recipe for Slow Cooker Turkey Sloppy Joes is sure to become a family favorite. A childhood classic just got a little bit healthier and a little bit more convenient! Don’t get me wrong: there’s nothing wrong with using a can of Manwich sauce to make the occasional Sloppy Joe. I was raised on the stuff, and my kids have become fond of it as well. But if I told you that I have a simple recipe for something even tastier, healthier, and easier, wouldn’t you want to give it a try? 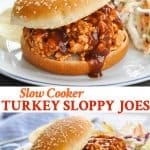 How do you make Slow Cooker Sloppy Joes? I promise, it’s so easy! You’ll start by browning the turkey meat in a skillet with onion and garlic. That’s the flavorful base for your sandwiches. While the turkey cooks, you have a few minutes to whisk together a simple sweet-and-sour sauce. 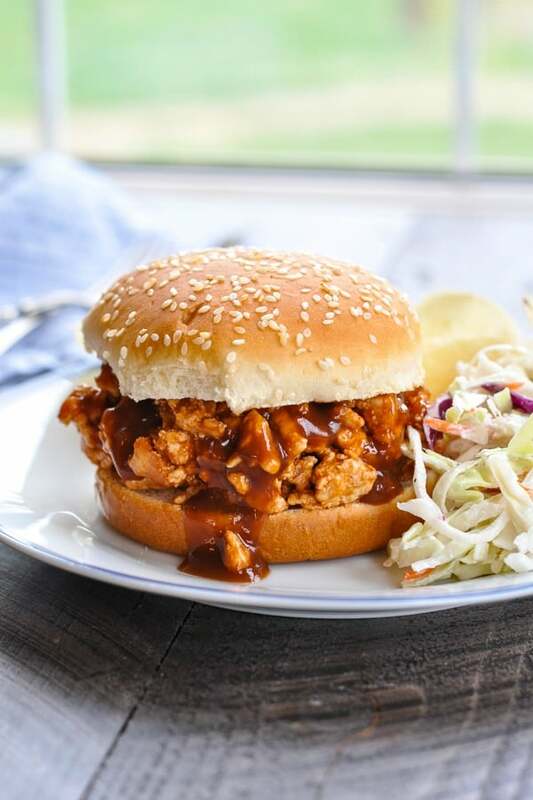 The sauce and the cooked turkey are transferred to your slow cooker, where they will come together and stay warm until you’re ready to serve your Turkey Sloppy Joes! That’s it, my friends. This sauce is full of sweet and savory spices, and after simmering for a few hours in your Crock Pot, the flavor gets that much better! The delicious sauce also keeps the lean turkey meat nice and moist, although you can certainly substitute ground beef or chicken if that’s your preference. In a large skillet over medium-high heat, brown turkey, onion, and garlic. Drain, and return meat to skillet. In a large bowl combine remaining ingredients to make the sauce. Pour sauce over meat mixture and stir. Cover and simmer over low heat for 10-15 minutes, stirring occasionally. Spoon meat onto sandwich buns to serve. We enjoy this dinner on sandwich rolls, but I also like to save the left-over meat for other purposes. It freezes perfectly! The leftover meat is great when you stuff it inside baked potatoes and top them with grated cheese. And we recently used some leftovers to make Sloppy Joe Taquitos (similar to these), which were a fun twist on the normal Mexican fare. I just used the sloppy joe meat, some shredded cheddar cheese, and flour tortillas. So basically, by cooking up a pot of these Slow Cooker Turkey Sloppy Joes, you’re really getting two meals in one. I just love efficiency. Even although browning the turkey and onion seems like an extra step it’s super important for flavor so don’t skip it. The sloppy joe mixture can be stored in the fridge for around 3 days or frozen in suitable containers. Cooking Just for Two? Cut all of the ingredients in half. The cooking instructions remain the same! In a large skillet over medium-high heat, brown turkey, onion, and garlic. Drain, and transfer meat mixture to slow cooker. Pour sauce over meat mixture and stir. Even although browning the turkey and onion seems like an extra step it's super important for flavor so don't skip it. Cover and simmer over low heat for 10-15 minutes, stirring occasionally. This post was originally published in October, 2014. The photos were updated in March, 2019.
great recipes and appreciate your sharing! We are trying to move away from prepared foods and sloppy joes will be great to make @ home and healthier with the turkey. I just love cooking with ground turkey, it picks up all the great flavors! 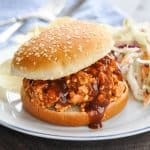 i have been scoping around looking for some new slow cooker recipes since i finally took mine out of summer hibernation! i am going to have to try these sloppy joes, they look so good..pinning these and may be making them this week since i have some turkey meat in the fridge! I grew up on the Manwich version too, but my kids have never had sloppy joes. I bet they would like these! Hi, Michelle! Yes, this is SO kid-friendly! I’m actually using this meat to make baked taquitos for dinner tonight. Everyone will love them! It’s so versatile, which is an added bonus. My kids like manwich, but I’m not a fan, so I’ll be trying your homemade version. Thanks for sharing it on Merry Monday. I always enjoy your recipes. I love being able to use ground turkey where I can, and this is the perfect idea! Thank you so much for linking up at Tasty Tuesday! Your recipe has been pinned to the Tasty Tuesday Pinterest board! Please join us again this week! I love that you are using ground turkey! And the sauce is from scratch too – I gotta try this out. Nothing against Manwhich, but from scratch is always better. Thanks for linking up at Show Me Saturday! Hope to you see there this week. These look delicious. I love the healthy approach. A wonderful comfort food. Thanks for joining us at Foodie Fridays. Hope to see you again this week. Perfect for busy Fall nights! Thanks for linking up with SNF! Pinned to our party board! This looks delicious, I could eat one right now! Thanks for linking up to Sweet and Savoury Sunday, stop by and link up again. Have a great day!! 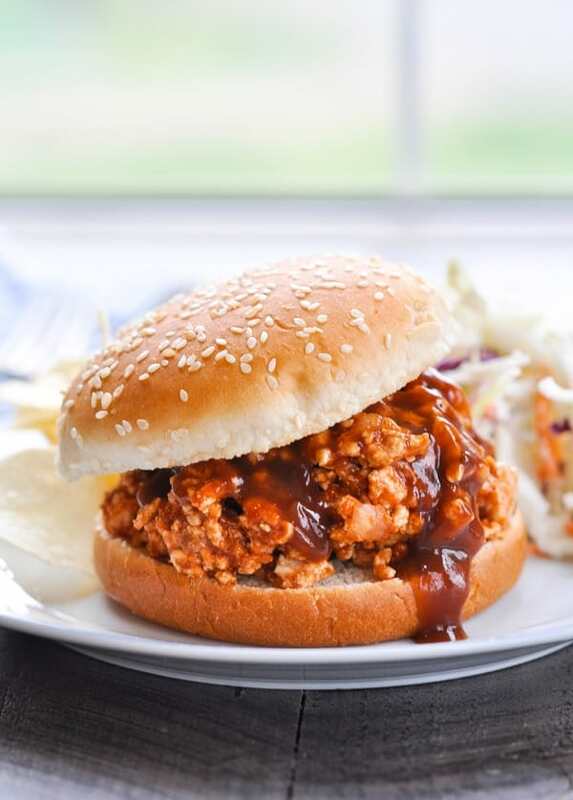 This is an amazing recipe for turkey sloppy joes. We’ve gotten away from eating red meat so I have had to find new recipes for turkey and chicken. These sloppy joes will be in our monthly recipe rotation. This recipe is so much better than manwich.